1. Solara calls Alnilam, the middle star in the Belt of Orion, AN. "It is directly aligned with the double stargate of Antares. Thus it represents the Moon and the Sun united as one. AN symbolizes the completion of duality, being both the dreamer and the dream. When the dreamer dances awake his dream, then the full potential of this central point is realized and the black hole is not only entered but transcended. The ancient civilizations of the Druids, Incas & Egyptians were all created by those of the AN lineage. In all of these, there was a joint rulership by husband and wife, who were also brother and sister. They also worship the Sun and Moon, not only as their gods, but as their true parents. The color of AN is magenta, symbolizing the completion of the rainbow when red and purple, the opposite ends of the spectrum, are combined. Horus, representing the union between Isis and Osiris, would be a child of AN. The symbol of AN is the sun disc above a crescent moon." (Solara, The Star-Borne, p. 244-245. This information is channeled). 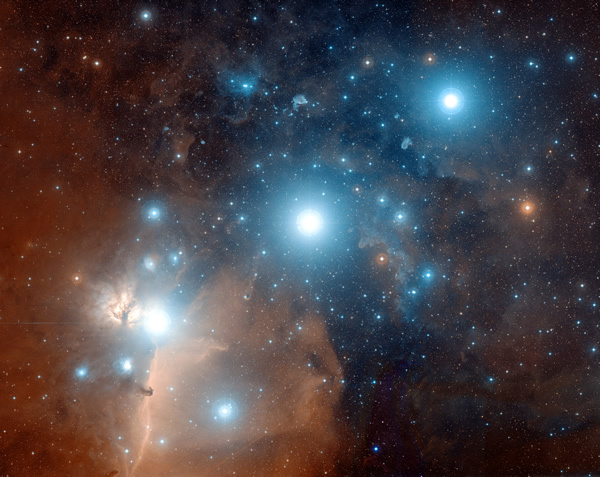 AN is part of the EL*AN*RA, the three stars (EL, AN and RA) that form the belt of Orion. See: Orion, EL*AN*RA, EL and RA for more information. 2. Still according to Solara, AN is also the name of the (pre-Inca) kingdom of AN, in ancient Peru, which was established by the ANs. According to the Legend, aliens built at least one city near Lake Titicaca, several thousands of years ago, long before man lived in the Andean mountains. (Even Edgar Cayce refers to these aliens, and calls them 'the OG.') Later on, man started to inhabit the Andean area: Lemurians came to South America, and the Atlanteans too started to spread out to Yucatan and South America. Eventually, contact was made between these aliens and the humans. Some aliens preferred to stay in their 'City of the Gods' (Tiahuanaco ? ), while others chose to integrate with the humans, thus establishing a new, mixed civilization. This was the Kingdom of AN. It was a highly developed society, that was in close contact with both Atlantis and Lemuria. When Lemuria was facing its destruction, a lot of Lemurians fled to AN. Its territory more or less coincides with the later empire of the Incas, who (oh synchronicity) worshiped the Sun and the Moon (cf. the Islands of the Sun and the Moon where the palaces of the Inca Emperor and Empress were). (Remember, the Sun and the Moon, are the symbols for [galactic] AN). 3. In Sumerian mythology, the name of the supreme deity is AN, or ANU. See ANU for more information.